I cannot take credit for these quilts. I bought the quilt tops, I did not piece them. I wish I had. Now Sheri Butler thinks I can sew. Anyway, I mailed these quilt tops to Sheri Butler after I sold my machine. I distinctly told her not to do anything special. I was thinking since I didn't make them, there was no real attachment. There is now!!! So anyway, we are entering these too quilts into UQSM (formerly HMQS). This one is a vintage quilt. I purchased the top from craigslist. They lady that purchased it had passed away and her husband was selling some of her things. This one is a baby quilt. I purchased the top from a quilt shop that went out of business in Liberty, MO. They're beautiful! I'd love to see what Sheri would have done if you HAD asked her to do something special! They are beautiful; WOW! What treasures. I'll be sure and look for them at UQSM and snap some photos for you. Wow! They are both beautiful! Wish my not special quilting looked like that! Well actually I wish my special quilting looked like that! Gorgeous. I hope they're both big winners! The look wonderful. Best of luck in the competition. PS; Sorry to hear about your Garmin engineers. Thank you. Such a sad situation. A girl that works in my department was in the restaurant when this happened too. She posted to Facebook when it happened that there was a shooter in the place while she was having dinner with some friends. This restaurant is just down the street from the Garmin headquarters. I do not work at headquarters, but that is where all the engineers work, so I did not know these young men. It could have been worse. So thankful to the young man that stepped up. So brave in the face of evil. That would be awesome. I was thinking of going, but probably will not make it. To see them hanging in the show would make my day....but it will really make Sheri's day. Wow! I love seeing the vintage tops quilted, and these are amazing! Mary Beth, you're too kind and good to me girl. But you also know my LOVE for saving/quilting antique tops!!! I told Mary Beth,,,i know what you said, but,,,, can I just do what I want? she said sure. Oh my goodness Mary Beth, those are so beautiful. I can never run across a buy like that anywhere. Sheri did a beautiful job on the quilting as well. Wishing you lots of luck at UQSM. Thank you. I found the antique top on Craigslist. The lady that had originally purchased it had passed away. 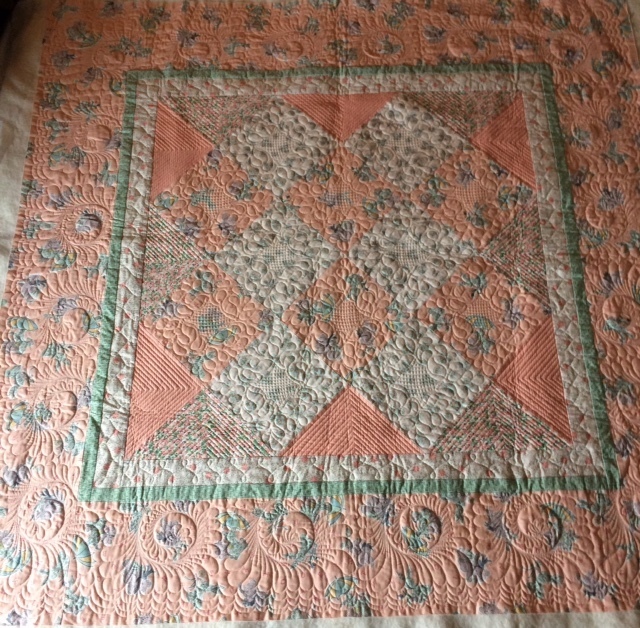 She was a hand quilter and her husband was selling some of the projects she had not done yet and one that was in process. I think I gave $40 for this top. I loved it. Yes, Sheri did an exceptional job. I entered in the Kansas City Region Quilt Festival the last time it was here, and it won 3 place. She did not want me to enter because she didn't think it was good enough. So, that is your lesson for the day. Stop being so hard on yourselves and your quilting. You all are rock stars!! Mary Beth, your a sweetie. Love my lesson, it does make me think about being too hard on myself sometimes, as I am way too hard on myself with my quilting. It is never good enough and of course I know it not good enough. I don't quilt for the public anymore, so I am not as concerned as I use to be about every little thing being perfect, which it never was, but it passed most of the time. Thanks again for the lesson and congratulations on winning 3 place with your quilt. I think that is fantastic. Oh, I know, But I appreciate it though. You can give me lessons anytime. These are STUNNING! Words almost fail me. The quilts are amazing! Love the quilting. I am just amazed at what you see and how you get there. Great job on both of them Sheri and MB, what a good friend she is. Now they are both very special for you. Those quilts turned out absolutely beautiful!! Wow, wow, WOW! 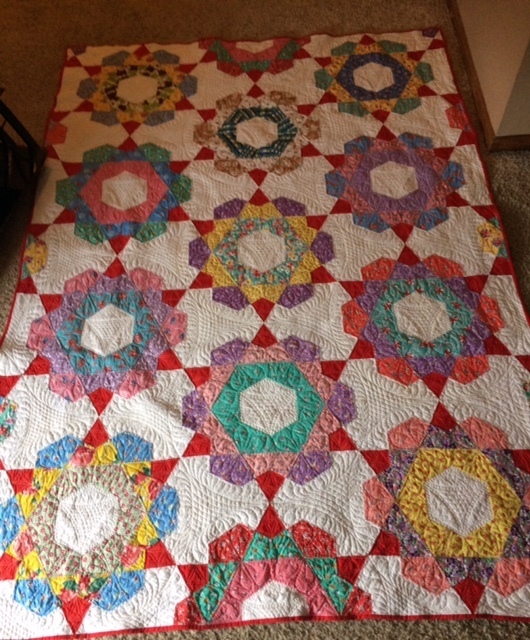 Great quilt finds, Mary Beth and stunning quilting by Sheri! I am in awe! Best of luck! Those are real treasures.